This is a patient who sustained a catbite two days earlier. The bite was to the third finger, which you can see is a bit blotchy and more swollen than the rest of the finger. 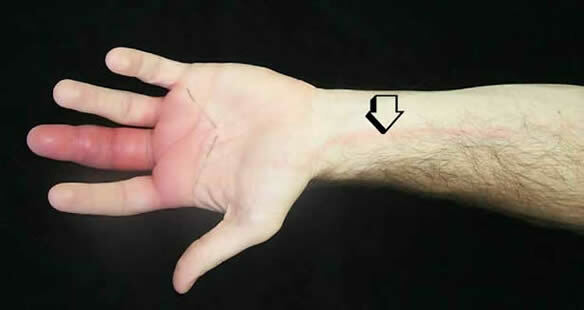 The redness that extends into the palm is called cellulitis (I have marked the limit of the redness with a pen) and the red streak up the arm (indicated by the arrow) is called ascending lymphangitis, because the red streak will gradually ascend up the arm, as the lymphatics become overwhelmed with infection. The old term for ascending lymphangitis is "blood poisoning."